Most well log and drilling data in the oil and gas industry is trapped within tapes and disk files of ancient and hard to access data formats like DLIS, LAS, LIS, BIT, XTF, WITS, ASC and SPWLA. These formats represents orphaned technologies and are outdated in all possible ways. Their syntax is overly complex, convoluted and awkward, available support software is limited, software tools are rare and documentation is poor or nonexistent. But still: These are the main storage and communication media for well logging information in the 2019. The amount of data is immense and growing, as is the aggregate cost of maintaining and utilizing this information. 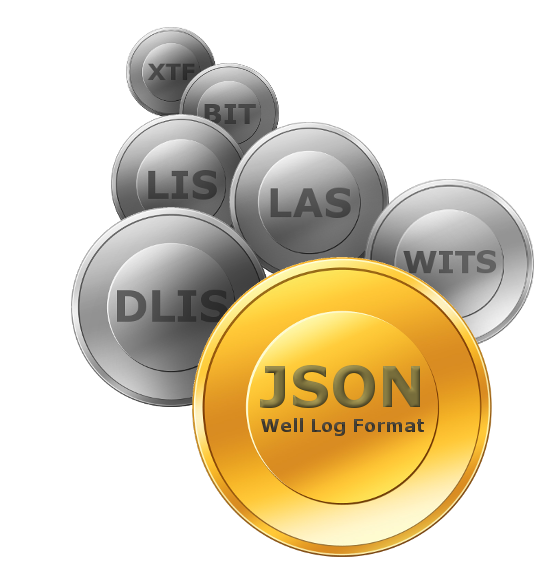 The JSON Well Log Format is a modern well log format designed for the future requirements of simplicity, compatibility, speed, massive storage, massive transmission, cloud computing and big data analytics. It overcome many of the deficiencies of existing well log formats. The JSON syntax can be efficiently parsed in any programming environment available. The well log semantics must still be understood by the client code, but this is far simpler to do navigating in-memory data structures in the programming environment at hand, instead of dealing with external disk resources of obscure proprietary formats. Also, numeric values that cannot be represented as sequences of digits (such as Infinity and NaN) must be avoided. The log header contains metadata that describes the overall logging operation and consists of any JSON objects and arrays that the producing entity find necessary and sufficient. However, in order to efficiently communicate metadata across disparate systems and companies the common properties listed below are defined as well known. Metadata outside this set has low informational value and is in general not fit for further processing. startIndex According to index value type Value of the first index. Unit according to index curve. endIndex According to index value type Value of the last index. Unit according to index curve. step According to index value type Distance between indices if regularly sampled. Unit according to index curve. If log is time based, milliseconds assumed. All header data are optional. name string Curve name or mnemonic. Mandatory. Non-null. description string Curve description. Optional. quantity string Curve quantity such as length, pressure, force etc. Optional. unit string Unit of measurement such as m, ft, bar, etc. Optional. valueType string Curve value type: float, integer, string, datetime or boolean. Non-null. Optional. float assumed if not present. dimensions integer Number of dimensions. [1,>. Non-null. Optional. 1 assumed if not present. Quantities and units should follow the Unit of Measure Standard from Energistics. To ease transition from legacy formats this is no requirement. In addition to the listed, clients may add any number of custom curve definition entries in any form supported by the JSON syntax, but as for header data in general this is not recommended. Curve data are specified in arrays for each index entry, with one entry per curve. If a curve is multi-dimensional, the entry is itself an array of subentries, one per dimension. Curve values are according to the value type defined for the curve, or null for no-values. The index curve is always the first curve listed, and must not contain no-values. It is advised that the index curve is continuously increasing or decreasing. Writing JSON well logs can be done in two different formats: condensed or pretty. The condensed format should be without whitespace and newlines and should be used for transmission between computers only. Schema for the JSON Well Log Format is available at https://jsonwelllogformat.org/schemas/JsonWellLogFormat.json. Access libraries, example code and a great variety of technologies associated with the JSON Well Log Format are available at our repository at GitHub. Thanks to Equinor all subsurface and production data from the Volve field on the Norwegian continental shelf has been disclosed and made available to the public. It can be downloaded from http://data.equinor.com.